West 23rd Street and the surrounding area is quite unique: part strip mall with its cityfied Home Depot, Olive Garden & Best Buy, part community housing for the creative-types in the Chelsea Hotel or the visually-impaired at Associated Blind Housing, utter chaos with all types of cars racing down the massive two-way street, sirens shrieking, cars honking, people smoking and laughing outside Gotham Comedy Club. And, nestled somewhere between Duane Reade and Garden of Eden is a little bakery with bright purple awning, called Madeleine Patisserie. Once upon a time, this charming little French cafe was a sad, dingy little clothing store that sold cheap clothes on wire hangers. Today, Madeleine Patisserie sells beautiful, scrumptious French pastries, and has lines to the door with people waiting to order these teeny-tiny cookies called macarons. 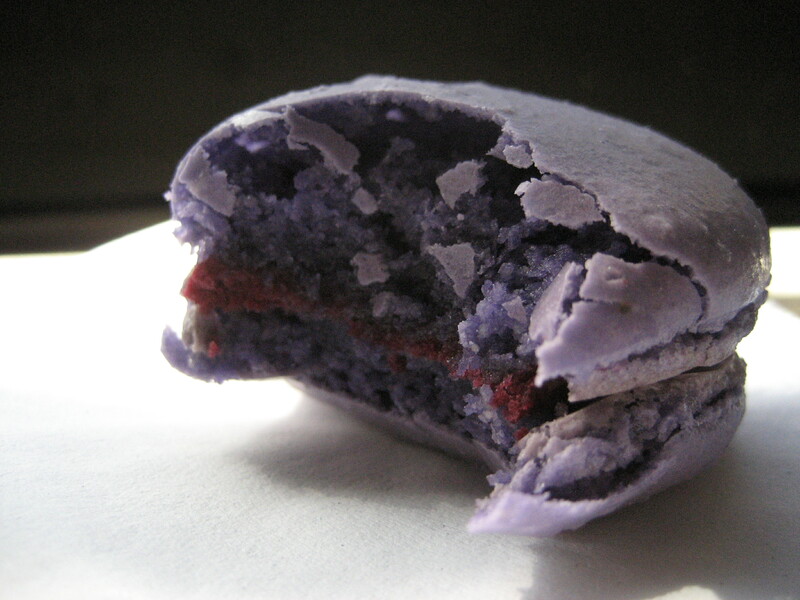 No, not the spiky little coconut styrofoam balls– macarons are completely different. These are delicate cookies with a wonderfully thin, crispy outer shell encasing two soft, chewy cookies that sandwich a silky smooth filling. They come in flavors like Caramel Fleur de Sel , Apricot and Champagne, Chocolate Rum Coconut, Pistachio, Lavendar, Rose…in all colors of the rainbow. My favorite is Cassis: a chic, smokey-purple cookie exterior that crumbles away to reveal a delectable berry filling, hints of creamy vanilla offsetting the fruity tang. It’s a fascinating marriage of textures– crisp yet soft, airy yet moist, with a deep flavor that fills your whole mouth. It’s just…lovely. I’ll leave it at that.